Eugene was first incorporated 150 years ago on Oct. 17, 1862. Join us in honoring our community’s history, celebrating the present, and creating a legacy of pride that builds excitement for Eugene’s future. Here are some of the events that were held to celebrate Eugene's 150th birthday. For information about upcoming events, including activities sponsored by various community groups, check the calendar on the right. A free commemorative Eugene@150 postcard along with a U.S. Postal Service cancellation stamp was distributed at the Eugene Skinner Cabin replica in Skinner Butte Park on Oct. 17. The event featured actors portraying Mary and Eugene Skinner, a Kalapuya story teller, and early explorer Joe Meek. The Old Time Fiddlers performed and the Emmaus Lutheran Quilt Makers presented a Eugene@150 quilt to Mayor Kitty Piercy. The postcard has the Eugene@150 logo on the front. The image on the cancellation stamp is a drawing of Eugene Skinner's original cabin. Eugene’s Birthday Party – Festivities were held on Oct. 20 with the dedication of Eugene’s newest cultural icon at 13th and Alder St. From there, members of the public took part in a procession to the Hult Center where there was music, entertainment and, of course, singing Happy Birthday and eating cake! 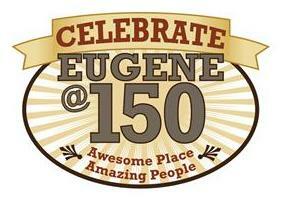 What's Your 150 - See what others are doing to celebrate Eugene's birthday and add your event or idea! Historic neighborhood tour -On Oct. 20, there were self-guided walking tours of east Skinner Butte Historic District. Story Catchers is recording and preserving personal stories from people in our community. Visit http://storycatchers.org for details about how to participate. The City of Eugene received a grant from the Oregon State Historical Commission to creation an iPhone app that is an interpretive map of historical places. Stories and Historical Vignettes – Eugene@150 partner KVAL TV produced a series of brief vignettes about moments in Eugene’s history including Eugene’s origin, our first park, dragging the gut, the Ducks first football game, Wayne Morse, Eugene Celebration, Animal House, and the Hult Center. See the vignettes at KVAL.com search for Eugene@150. A series of online videos about local history has been produced as a teaching tool for 3rd and 4th graders in Eugene 4J and Bethel schools. View the videos at http://or-eugene.civicplus.com/2284/Hunting-for-History.